Very cute boo. Clementine is covered in freckles, and she hates them. One day she decides to do something about them. She tries several things an nothing works. 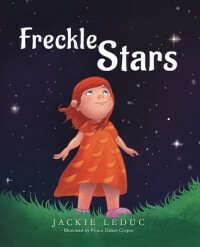 Her mother tells her that freckles are really stars and when you go to sleep they shine n the night sky. Clementine is smarter then that. She asks if they are stars how come she can see them before she goes to sleep. mother explains that just means other kids with freckles are already asleep. Now Clementine is happy about her special freckles. This book teaches a good lesson about being happy about yourself the way you are and it also teaches kids how people feel when you pick on them. I received this book from the Author or Publisher via Netgalley.com to read and review.